Final Four at Tauron Arena Krakow. After Over Timd: FT: 27-27. 1OT : 31-30. 2. Spain ESP 11 5 1 2 201: 207 3. 3. Croatia CRO 10 5 0 3 250: 219 4. 4. Norway NOR 9 4 1 3 235: 232 14. 5. France FRA 10 5 0 2 210: 182 1. 6. Denmark DEN 9 4 1 2 195: 180 2. 7. Poland POL 10 5 0 2 193: 194 6. 8. Sweden SWE 6 2 2 3 173: 168 7. 9. Russia RUS 5 2 1 3 160: 161 9. 10.Belarus BLR 4 2 0 4 167: 188 12. 11.Macedonia MKD 2 0 2 4 156: 176 10. 12.Hungary HUN 2 1 0 5 142: 166 8. 13.Iceland ISL 2 1 0 2 92: 101 5. 15.Serbia SRB 1 0 1 2 81: 92 13. 16.Montenegro MNE 0 0 0 3 76: 90 16. Germany and Slovenia replaced Austria and Czechia from Euro Men 2014. 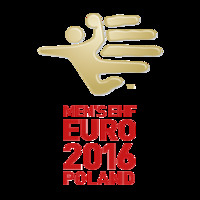 Germany, Spain and Croatia or Norway qualified to World Men 2017. Rest 12 teams will play in Play-Offs for 9 places in Europe_Qual Men 2016. Draw on Sun 31.01.2016 in Krakow. Sweden-Bosna Herzeg., Czechia, Macedonia, Poland-Netherlands, Russia-Montenegro, Serbia-Hungary, Iceland-Portugal, Slovenia - NOR/CRO, Belarus-Latvia, Denmark-Austria. Winner will qualify to Rio 2016 Olympic Men 2016. Best 2 teams (Norway and Sweden) not yet qualified to Olympic Qualification will qualify to Olympic Men OQ 2016. Macedonia stil can progress throw World Championship if Norway does not win the Championship. Played in same time with Africa Men 2016 and Asia Men 2016. _ Qualification 15 Teams from Europe Qual Men 2015. First 2 progress to Semi-Finals (1/2). 3rd and 4th to Classification. Norway and Croatia advanced to Semi-Finals. played at Tauron Arena, Krakow. transferred from Group A Poland 31-25 France, Poland 24-23 Macedonia and France 30-23 Macedonia. transferred from Group B Norway 34-31 Croatia, Norway 29-27 Belarus and Croatia 27-21 Belarus. Germany and Spain advanced to Semi-Finals. Spain with a 32:29 win wins the group. Sweden is 4th and will be in Olympic Men OQ 2016. Russia waits Norway to win the championship. played at Hala Stulecia, Wroclaw. transferred from Group C Spain 32-29 Germany, Spain 24-22 Sweden and Germany 27-26 Sweden. transferred from Group D Denmark 31-25 Russia, Denmark 30-22 Hungary and Russia 27-26 Hungary. First Groups Round. First 3 progress to Second Groups Round. 1. Poland POL 6 3 0 0 84: 76 +8 2. 2. France FRA 4 2 0 1 91: 80 +11 1. 3. Macedonia MKD 1 0 1 2 73: 81 -8 3. 4. Serbia SRB 1 0 1 2 81: 92 -11 4. Macedonia advanced due to better goal difference than Serbia -8:-11. No team from this group advanced to Final Four. 1. Norway NOR 4 2 0 1 88: 84 +4 4. 2. Croatia CRO 4 2 0 1 95: 83 +12 1. 3. Belarus BLR 2 1 0 2 87: 94 -7 3. 4. Iceland ISL 2 1 0 2 92: 101 -9 2. Norway was 1st due to win against Croatia 34-31. Belarus was 3rd due to win against Iceland 39-38. Norway's defeat against Iceland was not transferred to Group I.
Norway and Croatia advanced to Final Four. 1. Spain ESP 5 2 1 0 80: 75 +5 1. 2. Germany GER 4 2 0 1 81: 79 +2 3. 3. Sweden SWE 2 1 0 2 71: 72 -1 2. 4. Slovenia SLO 1 0 1 2 66: 72 -6 4. Spain and Croatia advanced to Final Four. 1. Denmark DEN 6 3 0 0 91: 75 +16 1. 2. Russia RUS 4 2 0 1 80: 78 +2 3. 3. Hungary HUN 2 1 0 2 80: 84 -4 2. 4. Montenegro MNE 0 0 0 3 76: 90 -14 4.
played at Ergo Arena, Gdansk / Sopot. Draw - 19.06 in Krakow. Group A: Tauron Arena, Krakow (15,000). France, Poland, Macedonia, Serbia. Group B: Spodek Arena, Katowice (10,000). Croatia, Iceland, Belarus, Norway. Group C: Centennial Hall, Wroclaw (6,500). Spain, Sweden, Germany, Slovenia. Group D: Ergo Arena, Gdansk (11,000). Denmark, Hungary, Russia, Montenegro. Iceland, Serbia, Montenegro - Best 3rd place.